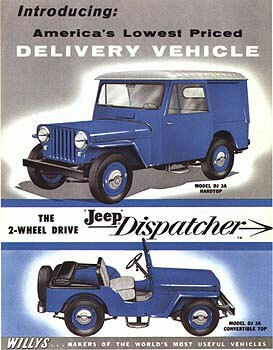 The Postal/Dispatch Jeep was made in two simple models, the DJ-3A (seen to the right) and the DJ-5. The DJ-3A was a flat fender Jeep similar to the CJ-3A except it was two wheel drive. It was produced from 1956 until 1965. 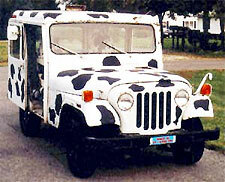 The DJ-5 came to life in 1965 and is which is the postal Jeep most people are familiar with today. They also produced a longer version from 1965 until 1968, the DJ-6. The DJ-5 was made by Jeep into the early 1970s and production continued under AM General. What a great concept! A CJ3B to deliver the mail. 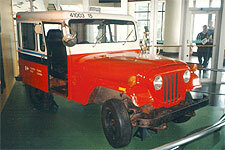 This may have been a turning point in the process of creating the DJ3A and postal jeep history, the first two-wheel drive version of the Jeep and the first Postal Jeep. The bottom picture is the DJ-5. In 1976 Postal Jeeps remained reliable and repair was simple for the DJ-5E "Electruck" version. It weighed nearly twice that of a gas powered jeep, thanks to the hefty batteries.